Now, more than ever, we need every woman’s voice to ensure equality, safety and opportunities for women here and around the world. We are a diverse group of women – women leaders, executives, corporate women, entrepreneurs, small business owners, health care professionals, lawyers and women across the professional spectrum including nonprofits and academia. This diversity allows us the benefit of exploring ideas and obtaining input from a variety of thought-provoking women. We are dedicated to equality for women and men in the workplace and in powerful decision-making positions in our society. We also advocate for women and families and strive to make this a better city and world. We support the goals and mission of our organization and the individual goals of our membership. We focus on every aspect of a woman’s life, including career, financial, mind and body health and of course families. If you are looking for a community of women who are collegial, and share the values of integrity, responsibility, respect for others and ourselves, want equality for all, and have fun you have come to the right place. We hope you will join us at one of our upcoming meetings – see our calendar for upcoming events – and we invite you to join us so we can continue to fight for women’s equality in every arena of society, meet our international sisters who visit NYC frequently and have expand your business contacts. Click to complete the membership application here. 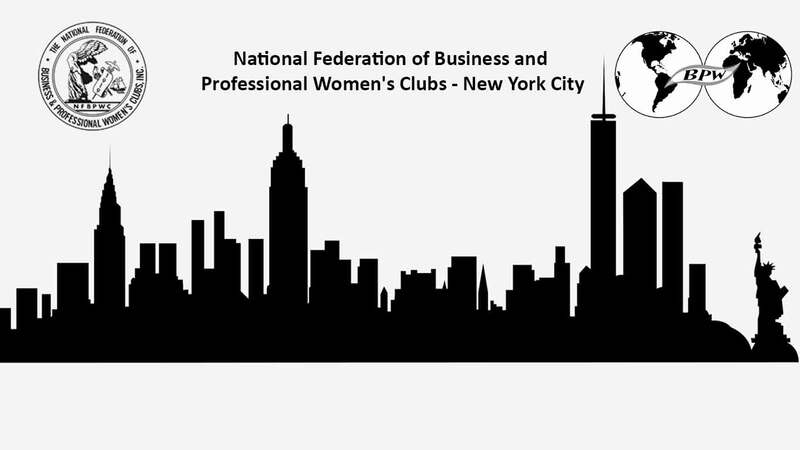 Membership in National Federation of Business and Professional Women’s Clubs, includes membership in our national network (NFBPWC-USA), and our international network (BPW International). Come be a part of this dynamic, committed organization with connections to women in 100+ countries; expand your international and national business opportunities, develop, and expand your personal and professional growth and enjoy the company of interesting women. With you as a member, we can continue making our communities aware of women’s needs, advocate for long lasting solutions and take action to see that the solutions become realities, and meet interesting women from around the world and here in our own back yard. If you would like further information or to speak to me directly please contact me at coach.francesca@gmail.com. My very best wishes for your success in every area of your life. Each and every member for her support of women’s rights in New York City, New York State, nationally and internationally. Your voice helps us influence our ability to obtain equality for women, as proven by the passage of the various equal pay laws in 2015, the Paid Family Act, the Elimination of the Salary History question in the job application process in NYC (effective 2018). Elizabeth Benham, Harriet Friedlander, Susan O’Malley, Lyn Henshl- Hirsch, Elizabeth Irwin, Tess Mateo, Mary Brophy and Houry Geudeiekian. The Hong Kong Economic and Trade Office for hosting us. Michelle Kawka, webmistress of NFBPWC-NYC.ORG. Join us so we can continue to fight for women’s equality in every arena of society, have some fun and meet interesting women from around the world and here in our own back yard. If you have any questions, please contact me coach.francesca@gmail.com.